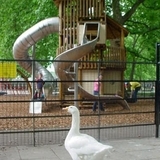 If you need a great way to entertain your children then take a visit to Coram's Fields in central London. Situated close to Russell Square tube station, is entirely child orientated and adults (anyone over 16 years old) are not allowed in unless accompanied by a child (under 16's only). Coram's Fields in set in the old site of Thomas Coram's Foundling Hospital, established by Captain Thomas Coram in 1739, and is a registered Grade II listed building. It reopened as Coram's Fields in 1936. It provides a free and an open, urban space for children to enjoy. There are seven acres of playground and park to explore. And there's to do, including a pets corner with farmyard animals, sports pitches, a paddling pool and a sandpit. Younger children can also enjoy Coram's Fields, with a nursery (2-4 year olds) and drop-in centre for under 5's. The park is also suitable for children with disabilities and they can take advantage of the recent addition of the sensory playground. There are plenty of spaces for a picnic, or instead visitors can enjoy the vegetarian restaurant. Why? Because the kids deserve a treat!